No, this isn't a belated Valentine's Day project. I realized that I never got around to sharing the finished paw prints so here they are! 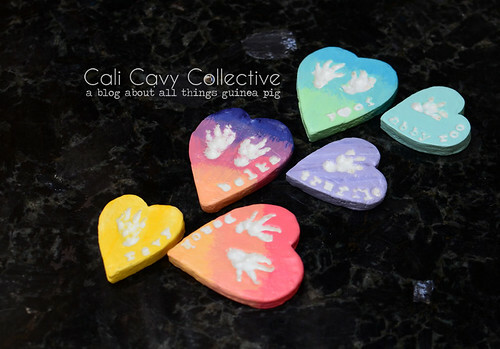 And in case you missed it the first time, a link to the DIY paw print tutorial. Certain pigs were more willing than others to cooperate... hence why a few hearts have one imprint while others have two. After the girls decided they had given me enough piggy attitude and were contentedly curled back inside their cozies, I used rubber stamps to personalize each keepsake with their name. The fun part came after the paw prints were fully dry - painting! I mixed acrylics and used different color schemes to highlight each imprint. Between planning, paw printing, pig wrangling, painting, and drying (tongue twister alert), the entire project took two weeks to complete. I haven't decided what I'm going to do with them yet - perhaps a shadow box display - but I love how they turned out. Made any of your own? Share them below!